A feature, significant to many galician towns and cities is the mix of commercial and domestic building use. Unlike the UK and USA, many Galician urbanizations have no visible demarcation separating business and commercial districts from those in which people live. The two simply inter-merge, often resulting in a mix of businesses, shops and houses on a single street. City centre living is also extremely popular and this is not a recent trend generated by urban renewal or a "yuppie" culture (as in the UK). Traditionally, Galician town dwellers always lived close to where they worked and socialised. This proximity is also nurtured by the desire to live near to a cultural hub, traditionally the town square or hall and more recently, theaters, clubs and other social centers ensuring a sense of community. What you will also notice in Galicia is the preponderance of small specialist retail outlets focusing on single product types like grocers, haberdashery’s, butchers and hardware stores. Department and super stores are far from uncommon, but the smaller shops, offering personal service and less popular or hard to get hold of lines, are far from extinct. Many of the shops in Galicia remind me of the stores I remember visiting with my parents as a child in England. The service is always friendly and someone invariably disappears in to a back room and comes out with the item you requested. In Galicia you won't see palm trees or cacti (or at least not many), but pine and eucalyptus, often in extensive forests. The ground will be green with the same fine grass you find in England and the northern states of America and many of the same wild flowers can also be seen in the meadows and hedgerows. Also look up to the sky for eagles. As long as you keep your eyes pealed it is almost impossible not to see one. I have no idea what kind of eagle they are, but they are very big and spend a lot of time on tree stumps and wooden pylons. If anyone reading this can put a name to them, then please let me know and I will add the information to this page. In 2004, we managed to video what we thought were 2 adult eagles play fighting with what we assumed to be a younger eagle, it was impressive to see. A drive down any coastal road should provide a myriad of spectacular views. Galicia has an aerial coast line similar to that of Norway, with bays, inlets and jagged coves (the Galicians call them "rias") feeding in to the sea. Galicia also has more coast line and beaches than any other region in Spain. If you want to sun yourself on a deserted beach, you really will be able to find one in Galicia. 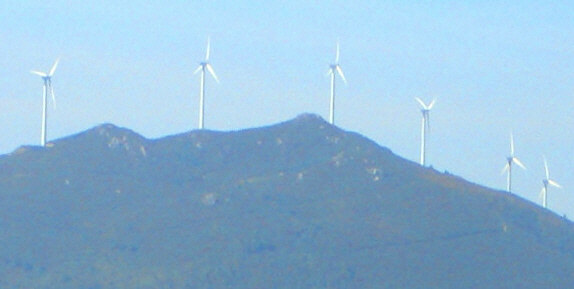 A more modern man-made feature you will see scattered about the Galician hills and mountains is the windmill. Galicia has a fairly constant breeze which evolves into a wind as your elevation increases. The whole of Spain is very energy conscious, more so than we are in the UK or USA, and as a result wind farms are everywhere. Personally I find the large white towers, on which the blades are supported, quite attractive in a "nature contrasting with a man-made structure" kind of way. Certainly the Galicians accept them and the protests that arise in the UK when similar wind farms are suggested do not appear to concern people here. Interestingly, just as I amend this page, there is up roar in the Yorkshire Dales over a planning consent given to the erection of, I believe 8, 300 foot tall windmills. Yet again the main prong of the objectors protest is that, whist they don't object to the concept of windmills in principle, they don't want them on their own door step. What an intellectually brilliant point of view!